COLUMBIA, South Carolina (CNN) -- South Carolina Republican Party Chairwoman Karen Floyd seemed to suggest Wednesday that the time had come for GOP Gov. 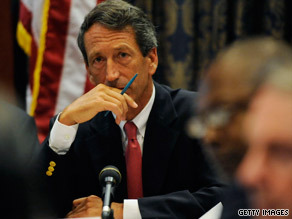 Mark Sanford to consider resigning from office. Gov. Mark Sanford has said it's better for him to keep his governorship to "learn lessons." "For the past two days, I have been speaking with Republican leaders across South Carolina," she said in a statement. "There is clearly a growing view that the time may have come for Governor Sanford to remove himself and his family from the limelight, so that he can devote his efforts full-time to repairing the damage in his personal life." The statement comes on the same day as a growing number of GOP state senators called for Sanford to step down. CNN has learned that GOP Sens. Daniel Verdin, Shane Martin, Ronnie Cromer and Wes Hayes joined the anti-Sanford chorus Wednesday morning, bringing the total number of Republican senators calling for the governor's resignation to 13. There are 27 Republicans in the state Senate. Another state senator stopped just short of calling for Sanford to step down Wednesday. Glenn McConnell, Senate president pro tempore, didn't explicitly ask Sanford to resign, but he did ask him "to do the right thing for himself, his family and our state." Sanford and his staff have said repeatedly this week that he will not resign. He wrote in a message to his political action committee e-mail list Monday that while he considered resigning, "I would ultimately be a better person and of more service in whatever doors God opened next in life if I stuck around to learn lessons rather than running and hiding down at the farm." Sanford's support among legislators and grassroots leaders in the state eroded considerably Tuesday after Sanford told The Associated Press he had met with his mistress more times than he had previously disclosed. He also admitted to dalliances with other women. At least four county GOP chairmen have also called for Sanford to go. Glenn McCall, the York County Republican Party chairman who has been leading a grassroots effort against the governor, said Wednesday that he and other conservative activists are postponing a rally at the State House next week because legislators are starting to come out strongly against Sanford. The rally had been scheduled to pressure Senate and House leaders to call for Sanford's resignation and start an investigation into his activities. But now that officials are publicly coming out against the governor and Attorney General Henry McMaster has begun investigating Sanford's travel records, McCall said the rally may not be necessary. "We are hoping that legislators can quietly, in private talks with the governor, ask him if he would please step down," McCall said. A top South Carolina Democrat also called for Sanford's resignation Wednesday. "While I believe an investigation should still be done to determine the full extent of Mark Sanford's abuse of power, [through] his long stream of confessions he has already revealed enough immoral and reprehensible behavior to justify asking him to step [down]," state Democratic Party Chairwoman Carol Fowler said in a statement. "State officials seem unable to do anything except worry and talk about Governor Sanford's extramarital affair, which we learn more about every few hours. "... South Carolina can't afford to be at a standstill for the next 18 months with a governor who ignores his job responsibilities while pursuing personal interests," the statement said. "Any other worker in South Carolina would be fired for not showing up at work with no notice." Late Tuesday, seven GOP senators, including Majority Leader Harvey Peeler, jointly issued a letter demanding that the governor step down because he has lost the trust of South Carolinians. "The bottom line is that the Governor's private matters should remain private, but his deception and negligence make it impossible for us to trust him, and for him to govern in the future," they wrote. Peeler told CNN that Sanford "has lost his ability to lead, and I'm afraid he has lost his ability to function as a man." "He is sitting all alone in that big governor's mansion, totally alone," Peeler said. "It's about leadership and moving forward and it's time for him to resign." Peeler issued the statement along with Sens. Hugh Leatherman, Paul Campbell, Thomas Alexander, Jake Knotts, Larry Martin and William O'Dell. Earlier Tuesday, two of Sanford's top conservative allies in the senate -- Larry Grooms and Kevin Bryant -- also said Sanford must go. The Greenville News, one of the largest papers in South Carolina, also issued a sharply worded editorial Wednesday telling Sanford to go. It wrote that Sanford has "acted like a heart-sick school boy, and he's revealed facts that clearly demonstrate he is capable of exceptional deception, arrogance and narcissism." The attorney general of South Carolina asked the State Law Enforcement Division to review Sanford's travel records after the governor admitted Tuesday to more visits with his mistress than previously disclosed. The review by law enforcement officials would be the first formal investigation into whether Sanford abused his power while carrying on his affair. State Law Enforcement Division Chief Reggie Lloyd said he would not characterize the review as a criminal investigation. He told reporters on a conference call that law enforcement officials are reviewing documents from the governor's office going back to 2003, when Sanford came to power. He said the review should be concluded by the end of the week. Attorney General Henry McMaster, a Republican, had been reluctant to move forward with calls for an investigation into Sanford, saying he is wary of mixing legal matters with political score-settling from longtime Sanford opponents. However, an aide to McMaster told CNN on Tuesday that "that all changed this morning when the governor disclosed additional trips that were not disclosed last week." Sanford said in a statement Tuesday that he's "pleased that [the State Law Enforcement Division] will look into this matter." "There's been a lot of speculation and innuendo on whether or not public moneys were used to advance my admitted unfaithfulness. To be very clear: no public money was ever used in connection with this."